It’s time for another instalment of Wine and Love created by Nora, and hosted by Suki. 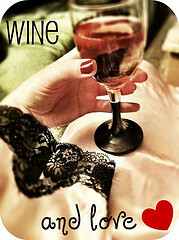 The concept is simple – each Thursday you post about what’s making you reach for the wine glass and what you’re loving. Work and school. It’s always the same. I’m not going to go into details. My grandfather’s been really unwell. I’m sad that he’s so uncomfortable. I’m frustrated that there isn’t anything that can be done to make him more comfortable and I’m mad the doctors are refusing to operate. My grandmother turned 80 this week! Can you imagine? She’s in good health, she’s pretty with it (what 80 year old do you know that has an iPad, a Twitter account and an eReader?!? My Gram does), and she volunteers still as a teacher at the senior’s centre. Amazing. Summer hours start at work this week! That means from now until Labour Day, my weekend starts at noon on Fridays. This weekend marks the first long weekend of the summer! Wooooo. I’m so looking forward to my 3.5 day-long weekend. I’m thinking about buying an eReader. Someone STOP ME. I was given some birthday money and I’ve gone from not spending anything to spending ALL THE MONEY. I think I need an intervention. I’m reading Deadlocked. I love these books. I don’t care what anyone says. I can hear you judging me. But they’re awesome. It’s been my first guilty pleasure read in a year. What are you whining about and loving this week?